Can you believe it's the last day of July? Holy heck, how the Summer is flying by. Luckily for us, we still have 4 weeks til the kids go back to school. I actually really love having them home with me! I'm sure I can only say that because they are older and more self-sufficient. I sure remember how hard it was when they were younger and needed entertained all Summer long. 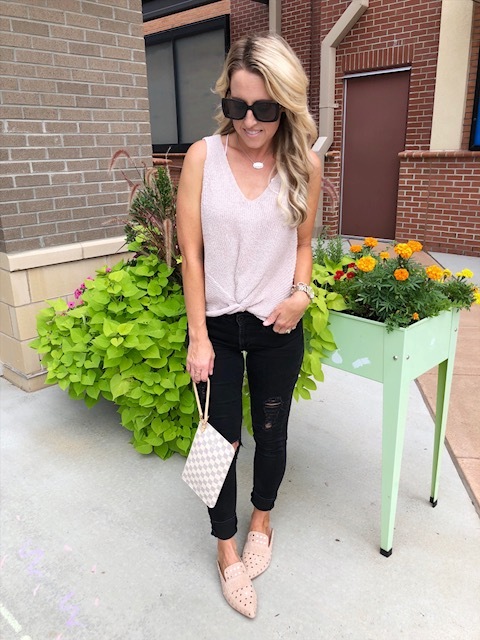 A couple weeks ago, I introduced you all to one of my favorite local boutiques, The Pink Magnolia Boutique (read about my last visit here). I stopped in last week to see their new arrivals (remember they get new arrivals all the time). So I thought I'd share my finds with you! Use code NEW20 for 20% off your order!! This yellow color is so big for Fall!! 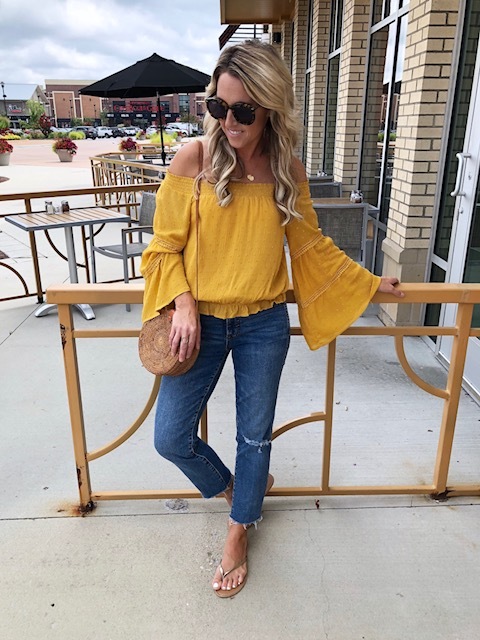 Add an off-the-shoulder fit and bell sleeves and you've got one heck of a top!!! And I love the subtle polka dot details. I've mentioned before how much I love sweater tanks. I think they are adorable for Summer but work moving into Fall as well. 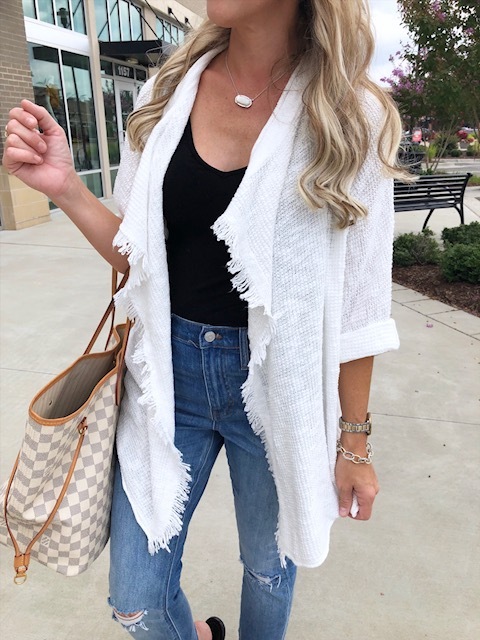 This one is too cute with the v-neck and twist front detail. I layered my favorite bralette under it. 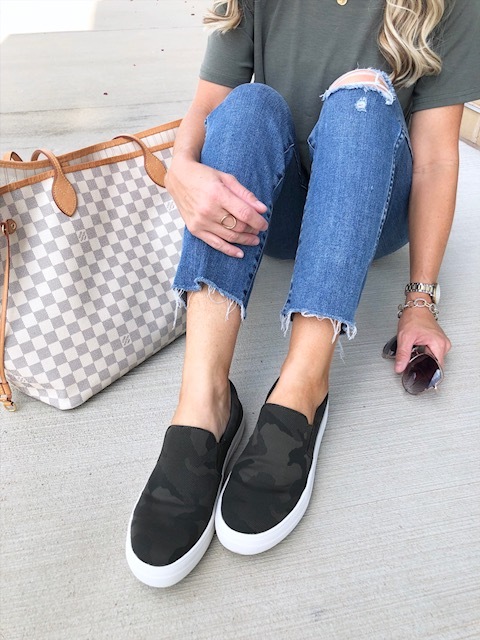 The perfect weekend basics...a fun tee and sneakers. 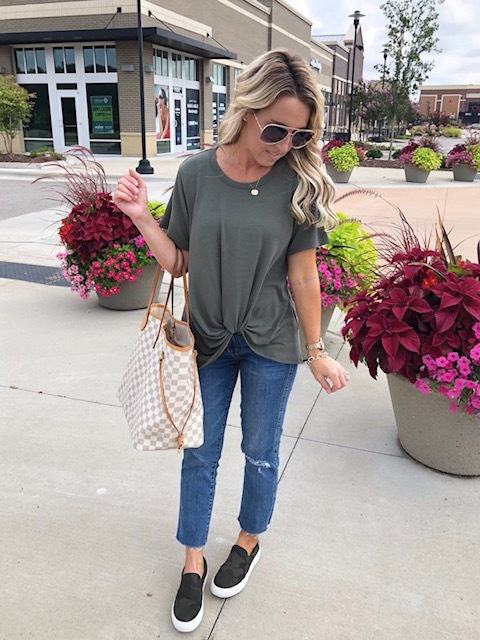 This tee is so incredibly soft and I love the twist detail on this top too. How great are these camo sneakers? They have a slight platform to them and the camo is actually more satin-like than canvas. Everyone needs a basic layering tank. 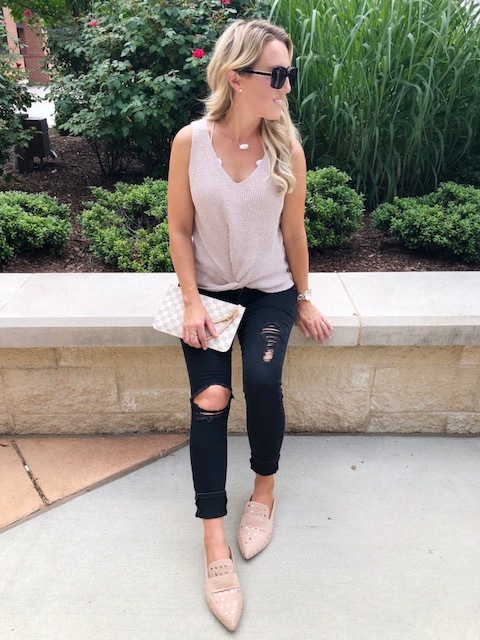 What's special about this one is that it can be worn forward or backward, depending on if you want a v-neck or a scoop-neck!! Two for one!!! 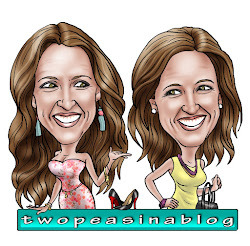 To see what else they have in store or to place a phone order, click here.